The Marshall Plan (officially called the European Recovery Program [ERP]) was a plan of the United States for rebuilding the allied countries of Europe after World War II. One of the main reasons this was done was to stop communism (basically the USSR). The plan was named after Secretary of State George Marshall, but the plan was worked out by other people in the State Department. The plan ran for four years beginning in April 1948. During that period US$ 13 billion in economic and technical help were given to help the recovery of the European countries that had joined in the Organization for European Economic Co-operation. By the time the plan ended, the economy of every member state had grown well past pre-war levels. In recent years some historians have said that another reason for the plan was to make the United States stronger, and to make the countries of western Europe need the United States. They also say that the United Nations(UN) Relief and Rehabilitation Administration, which helped millions of refugees from 1944 to 1947, it also helped the European postwar recovery. U.S. Treasury Secretary Henry Morgenthau, Jr. said that if Europe needed money to rebuild what had been destroyed by the war, they should take it from Germany. This money was called war reparations. Morgenthau said it would also stop Germany from ever being rebuilt, and threatening to start another war. Taking money from Germany was done after World War I. It did not work. Instead of helping other countries it hurt them. This is because companies could not sell the coal and steel that they made because it was coming in free from Germany. Jean Monnet of France said that France should control the German coal areas of the Ruhr and Saar and use it to rebuild French industry. In 1946 the occupying powers agreed to put strict limits on how quickly Germany could reindustrialize. Limits were placed on how much coal and steel could be produced. This was the first German industrial plan. It was signed in early 1946 and said that German heavy industry was to be cut down to half% of its 1938 levels by the destroying 1,500 manufacturing plants. By the end of 1946 governments could see the problems of the plan, and the agreement was changed several times, the last time in 1949. But dismantling factories went on into 1950. Germany had been very important to the economy of Europe for a long time. This meant that a poor Germany was holding back European recovery, because other countries could not sell so many things to Germany. A poor Germany was also expensive for the occupying powers. They had to give Germany food and other things which it needed and could not grow or make for itself anymore. Because of this the Morgenthau and Monnet plans were rejected. One of a number of posters created to promote the Marshall Plan in Europe. The blue-white flag between the German and Italian ones is a version of the Trieste flag. The Marshall Plan ended in 1952. Ideas to extend it were stopped because of the cost of the Korean War and rearmament. U.S. Republicans hostile to the plan had also gained seats in the 1950 Congressional elections. The Marshall Plan has been described as "the most unselfish act in history." However, this may not be the case. The United States benefited from the plan because part of the agreement for giving the aid was that country would have to open up their economies to US companies. "Historical revisionist" historians, such as Walter LaFeber, during the 1960s and 1970s said that the plan was American economic imperialism. That means, that it was an attempt to gain control over Western Europe just as the Soviets controlled Eastern Europe. Tyler Cowen, economist, has said that nations receiving the most aid from the Marshall Plan (Britain, Sweden, Greece) saw the least returns and grew the least between 1947 and 1955. Those nations who received little (e.g. Austria) grew the most. Alliance for Progress failed Central and South American Marshall Plan. GARIOA (Government and Relief in Occupied Areas) The precursor of the Marshall plan aid. Grogin, Robert C. Natural Enemies: The United States and the Soviet Union in the Cold War, 1917 – 1991. Lanham, Md. : Lexington Books, 2001. Hogan, Michael J. The Marshall Plan: America, Britain, and the Reconstruction of Western Europe, 1947 – 1952. Cambridge: Cambridge University Press, 1987. Milward, Alan S. The Reconstruction of Western Europe, 1945 – 51. London: Methuen, 1984. ↑ The $13 billion compares to the U.S. gross domestic product of $41 billion in 1949. ↑ Henry C. Wallich, Mainsprings of the German Revival (1955), pg. 348. 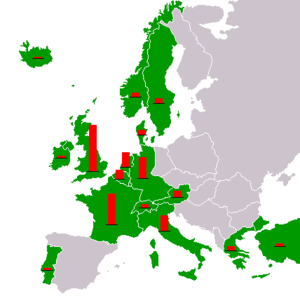 Wikimedia Commons has media related to Marshall Plan. This page was last changed on 11 December 2018, at 17:36.